Concerts across Oklahoma fill the next week with music. 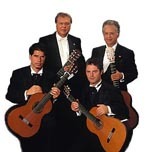 Romeros Guitar Quartet performs at Armstrong Auditorium in Edmond on November 3rd beginning at 7:30 p.m. This musical group is made up of three generations of classical guitarists. They have been called the “Royal Family of the Spanish Guitar.” The family emigrated from Spain in the late 1950s, and each son began playing the guitar at age two or three. They have played for Pope John Paul II in the Vatican, Prince Charles of Wales, and the White House on two occasions. Celedonio Romero, the creator of the quartet, died 15 years ago in May. In 1961, the Romeros Guitar Quartet was featured on The Ed Sullivan Show during their first tour, and continues to play with their next show in Edmond. The Sooner Theatre on Main Street in Norman hosts saxophonist Tom Braxton on November 4th. Braxton’s performance “A Tribute to Wayman Tisdale” begins at 8 p.m. and features the smooth jazz style Wayman Tisdale’s fans remember. Tom Braxton met Tisdale through a producer, and in 1992, they played a concert opening for The Yellowjackets. They continued to tour together for 17 years, and Braxton was Tisdale’s musical director for a decade during that time. Tom Braxton has also played with many other famous musicians including Aretha Franklin and Luther Vandross, and has opened for The Rippingtons and Dave Brubeck. Country artist Pam Tillis plays at the McSwain Theatre in Ada on November 5th at 7 p.m. Tillis was the Country Music Association’s 1994 Female Vocalist of the Year, and was nominated for three separate Grammys. A member of the Grand Ol’ Opry and daughter of Mel Tillis, Pam Tillis began performing at 8 and had her first chart topping songs in the early 1990s. A few songs she is best known for include “Shake the Sugar Tree”, “Cleopatra, Queen of Denial”, and “Maybe It Was Memphis.” Tillis has also written for ChakaKhan, Martina McBride, Conway Twitty, and more. Tillis is starring in a new movie “The Goree Girls” with Jennifer Aniston, a country musical set in the 1940s. Other concerts worth checking out include Ben Folds with the OKC Philharmonic, Norman Chamber Players “Voices of Fall”, and Sam the Cellist at Bell Isle Library. Film enthusiasts will enjoy events like French Films at UCO, Cinematic Artists of Norman’s 12 X 5 presentations, and the American Indian Cinema Showcase at the Oklahoma City Museum of Art. More concerts, films, and other events are on our calendar page.